Beyond our normal observing sessions, our club is very community-oriented. We do private star parties for many occasions - school functions, birthday parties, or even teaching somebody how to use a new telescope. We offer this service at no cost, though will certainly welcome a donation or a meal (if your function is serving food to its guests). If you are looking to have us at your event, we strongly recommend contacting us before the event is planned, if possible. This gives us the opportunity to suggest dates that work best for public events (specifically, dates where the moon and planets will be visible). If that isn't possible, the earlier you can work with us, the better. Since we do this as a hobby, it can be difficult to find available astronomers at the last minute. 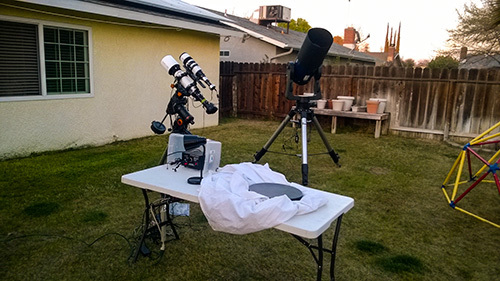 Typically, a private star party stars will star with a short presentation talking about what we do, how telescopes work, and the types of objects that we will be looking at that night. We will then show the group the major constellations that are visible at that time, and then use our telescopes to show you some objects. Children are welcome to participate, but please explain to them the importance of being careful around the scopes, as some of our equipment can get very expensive. To get more information, visit the Board Members page and contact one of the Star Party Coordinators. Thank you!